Fires are breaking out all over North Carolina from human caused to unknown causes which are being fiercely investigated by Law Enforcement agencies. Evacuations are in effect for Swain County. Shelter is available if residents need it by contacting the Swain County Sheriff Office Dispatch at 828-488-2196. The Shelter is located at the Swain County Senior Center. Avey Branch: Start 10/4/2016 @ 7:44 PM. Unknown cause. N of Santeelah Lake. Rocky Mtn Blue Team managing fire. *Merged with Maple Springs Fire* 1,200 acres. 17% containment status. ire being monitored, patrolled and in mop-up operations. Fire managed by Rocky Mountain Blue Management Team. Fire Fact: All North Carolina State Parks are closed due to the wildfires. Boardtree Fire (NEW): Start date unknown. Location unknown. 0.5 acres. Boteler Fire: Started 10/25/2016. Shooting Creek community, 6 miles east of Hayesville (Clay County), NC. 8,180 acres. 12% containment status. Fire behavior is active, uphill runs, flanking and backing. 545 Personnel. Managed by SA Red Team. Air tankers and helicopters dropped water and retardant to create a barrier. Buck Creek Fire: Fire being monitored, patrolled and in mop-up operations. The Fire has not grown but leaf fall continues and is causing fire danger. 8 acres. Containment status unknown. Fire Fact: 20+ Wildfires burning over 17,000 acres are suspected arson caused. Charley Creek Fire: Fire being monitored, patrolled and in mop-up operations. The Fire has not grown but leaf fall continues and is causing fire danger. 3 acres. N/A containment status. Cliffside Fire: Start 11/2/2016. Human caused. 3 miles NW of Highlands, NC. 101 acres. 98% containment status. 1 Personnel. Managed by SA Red Card team. Dicks Creek Fire: Start 10/23/2016. Dicks Creek Drainage, 2 miles NW of Sylva, (Jackson County) NC. Human caused. 2nd time reburn. 20 acres on interior. Original fire 728 acres. 90% containment status. 30 personnel. minimally active, creeping and smoldering and reburning as more leaves fall within the perimeter. Dobson Fire 3 (NEW): Unknown start. 486 acres. 40% containment status. 83 personnel assigned. Fire Fact: The State of Emergency has been declared for 25 Counties in South Carolina. Eastern Cherokee Complex (NEW): 14 fires within the 10 miles radius of Cherokee Nation. Eastern Cherokee Agency. 486 total acres. Southern Area Blue Team (CA) managing fires. 1 Type-1 Hotshot (20 people), 130 personnel. 40% containment status. State of Emergency declared. $100,000 reward for Tips leading to arrest for arson fires being set. Contact Law Enforcement at 800-47-ARSON. Fires being tirelessly investigated by Police. Falls Fire (NEW): No info. Ferebee Fire: Start 11/6/2016. 1 mile north of Nantahala, NC. Unknown cause. 2,950 acres. 34% containment status. 172 personnel. Fire behavior is active, flanking, and backing. Fire crews will continue to provide structure and point protection for critical infrastructure. Fire is expected to spread to north and east. Fire Fact: In addition to North Carolina, 2 other States also investigating Arson-related wildfires. Grape Cove Fire: Fire being monitored, patrolled and in mop-up operations. The Fire has not grown but leaf fall continues and is causing fire danger. 35 acres. Unknown containment status. 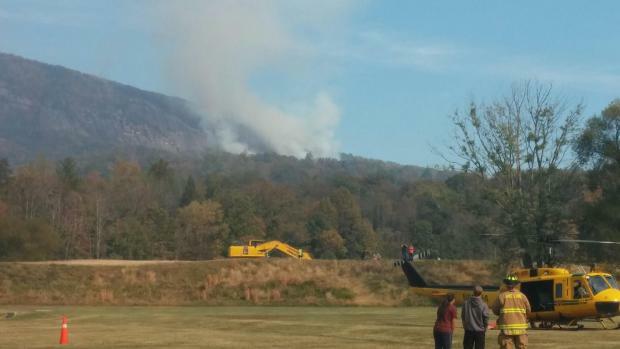 Jones Gap Fire: Fire being monitored, patrolled and in mop-up operations. The Fire has not grown but leaf fall continues and is causing fire danger. 115 acres. Unknown containment status. Fire Fact: The States of Georgia and Tennessee are also in State of Emergencies. Knob Fire: Start 11/2/2016. 8 miles west of Franklin, (Macon County) NC, on Rocky Knob. Human caused. 90% containment status. 1,130 acres. . 3 personnel. Fire behavior is moderate, creeping and smoldering. Burnout operations in effect. Maple Springs/Roughy Fire: Start 11/4/2016. North of Santeetlah Lake. North of Santeetlah Lake. Unknown cause. 6,065 acres. 10% containment status. 300 personnel assigned. Behavior is active, uphill runs and short-range spotting. Crews to continue constructing containment lines, firing, and holding critical line segments in the evening. Fire managed by Rocky Mountain Blue Management Team. May Branch: Start 11/3/2016. West of Nanatahala Lake. Human caused. 175 acres. 50% contained. 34 personnel assigned. Fire behavior is active, flanking, backing and creeping. Muskrat Valley Fire (NEW): Start 11/11/2016. Near Hwy 64 and SW of Franklin, NC. Unknown cause. One 20-person crew and 2 engines. 90 acres. 50% contained. Ridge Gap Fire (NEW): Unknown start date or location. 2 acres. Unknown containment status. Tellico Fire: Started 10/23/2016. 3 miles south of Almond, NC, Human caused. 9,982 acres. 23% containment status. Fire burned over Paint Mountain. Naturally wants to merge with Ferebee Fire in Swain and Macon Counties. 7 crews, 46 engines, 9 dozers, 3 water tenders. NW Winds 7-15 mph with gusts up to 25 mph expected. RH down to 25%. Fire Fact: Arson Fires put Lives in Danger. See Something? Say Something? Call to report Tips to 1-800-47-ARSON. 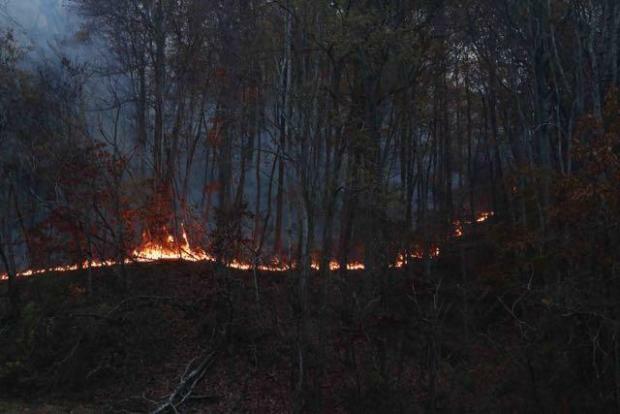 Whitewater Fire: Jackson County. Start date unknown. 23 acres. 0% contained. Crews to secure/strengthen containment lines. Fire being monitored, patrolled and in mop-up operations. Wine Spring Fire: Fire being monitored, patrolled and in mop-up operations. 95 acres. Containment status unknown. The Fire has not grown but leaf fall continues and is causing fire danger.